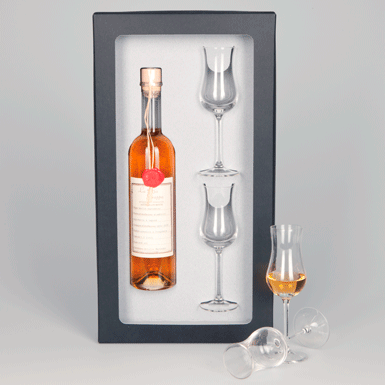 An attractive gift which is all about grappa: Two stylish hand-blown grappa glasses and a decorative bottle filled with 50 cl of finest grappa affinata. Pleasure made easy! This item is only sold to adults. The Swiss law prohibits the sale of alcoholic drinks to persons under the age of 18. In order to comply with the legal directives, we may have to ask for your date of birth.